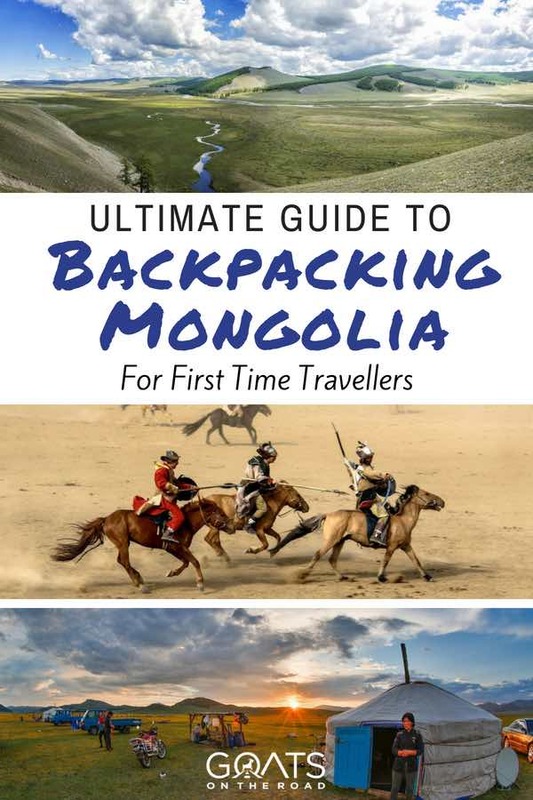 In this Mongolia travel guide, you will learn everything you need to know about traveling Mongolia on a budget, including things that you’ll never find in your guide book. Known as “the land of blue sky”, Mongolia is an undiscovered, backpacker’s paradise. Where else in the world can you pitch a tent for free in a 1.6 million km² campground, with stunning rolling green hills, grasslands, lakes and rivers as a backdrop? Load up your backpack with supplies and disappear into the steppe for a few days, a week or even a month. When traveling Mongolia, the whole country is your campsite. Get lost in the Mongolian Desert, one of the most hostile deserts on the planet, or try your hand at fishing and cast your line into slow-moving waters with 200 lb monsters lingering under the surface. Witness a nomadic culture and a level of freedom that is unmatched anywhere else on the planet. With a population of less than 3 million people, (half of which are found in the capital, with the remainder scattered around the countryside) this is one of the least populous places on Earth. There is nowhere quite like Mongolia. How Much Will Traveling Mongolia Cost? The budget for traveling Mongolia really depends on what you do in the country. You could live off of next to nothing if you are just trekking the vast open steppe and sleeping in your tent every night (highly recommended). $65 / day for 2 people will allow you to travel around the country by bus, stay in nice double rooms (or gers) and go on the occasional excursion. 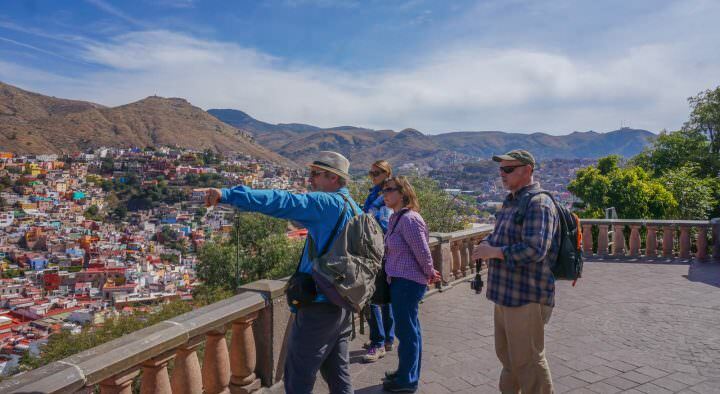 On multi-day, independent treks, you could live off of much less but if you’re traveling often, long bus rides can add up and you’ll spend much more. Accommodation when traveling Mongolia varies from beautiful hotels and tourist gers (Mongolian yurts), to slightly musky, run-down gers with goat meat drying above your bed. Sometimes, you may even be offered to stay with a family for free, but a small offering or donation is recommended for such generosity. In major cities like Tsetserleg, Ulan Bator (UB) & Mörön, you can expect some nice hotel rooms (about $15-35/night), while in the countryside you’ll likely sleep in a ger or your tent. 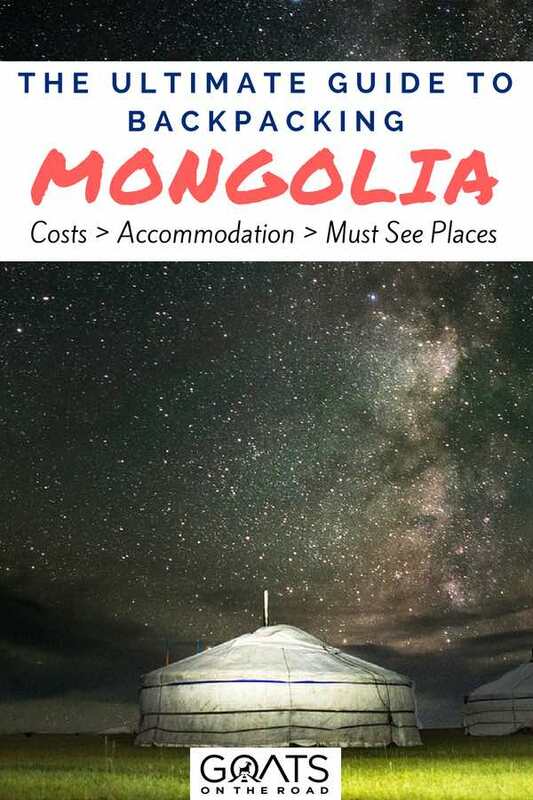 ☞ Click here to compare prices and see reviews on accommodation options in Mongolia with Booking.com. Again, these prices vary greatly depending on where you are in the country. Some small, dusty villages will serve up tasty stews and soups for just a couple of bucks, but in Ulan Bator and other major cities, expect to pay at least $5 for a cheap meal. *Note: traveling Mongolia isn’t a foodie experience. Probably the only time you’ll be paying entrance fees will be at National Parks, museums and temples. Entrance fees are very reasonable, even in Ulan Bator. Typical costs are between $1 – $3. Alcohol probably won’t be a large part of your budget while traveling Mongolia but a nice, cold bottle of Chinggis beer will cost you about $1.50 and cocktails will be around $5. Vodka is also popular and Mongolians have customs you must follow before taking a shot of this liquor. It’s recommended to have a drink of straight vodka after eating foods your stomach may not be used to. Locals also drink fermented mare’s milk (arag) which you’ll probably be offered many times during your stay. This foul tonic will likely be free. Tipping is not customary in Mongolia but as more and more tourists visit the country, a small gratuity is expected at bars and restaurants that cater to foreigners. Tipping your guide and driver after a tour is also expected and appreciated. 10% is acceptable. There are far too many “must-see” places in Mongolia to list here. We spent 1 month traveling Mongolia and we still have much to see. This country is vast and there seems to be highlights at all four corners of this massive nation. We’ve listed just a few of the must-see places below. Some we have seen, some we “must see” next time! If you have arrived in Ulan Bator (Also: Ulaanbaatar or U.B) and you think that it’s an unattractive slum, then you probably won’t find any other city in Mongolia very appealing. But you’re not here for the cities and while Ulan Bator can appear to be a chaotic mess at first glance, there are some very nice areas and it does have some charm. The museums and cultural shows in the capital city are wonderful and if you’re heading out into the wilds of Mongolia, this is where you’ll want to stock up on food and goods. Check out the State Department Store for food, clothing and outdoor gear. Gorkhi-Terelj National Park is one of Mongolia’s premier hiking, trekking and camping destinations and it’s close proximity to the capital (37 km from U.B) means that it’s a popular holiday spot for locals. There is an excellent selection of tourist gers here and at nearly 3,000 km², there’s a lot of space to wander! Probably Mongolia’s most attractive looking sum (provincial capital), Tsetserleg is a great place to start on treks to Terkhin Tsagaan Nuur (White Lake) and Tsetserleg Hot Springs (30 km away). The town itself is nestled in a forested valley near the Khangai mountains and there is a nice monastery and local market to keep you busy for a couple of days while you plan your trips in the area. ** Goat Note: If you visit Tsetserleg, it would be a shame not to stay at Fairfield Guest House. Although it’s not the cheapest option, it’s BY FAR the best. Run by a delightful Australian couple, Fairfield is the main backpacker hangout. Known as “Mother Ocean”, Lake Khövsgöl (Khövsgöl Nuur) is the largest lake in Mongolia by volume and is also one of the main tourist attractions in the country. The lake is located in the far north, close to the Russian border and it’s not easy to get here without a flight. 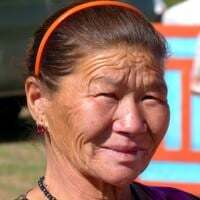 If you don’t fly into the city of Moron (the closest airport to the lake), in order to get here independently, you’ll have to take a bumpy 15 hour bus ride from UB to Moron, and another 2-4 hour ride to the southern lakeside town of Khatgal. The other option is to take a tour out of UB. Once you get here you’ll likely see why so many people decide to make the difficult journey. Khövsgöl is the perfect place for horse trekking, hiking, canoeing, fishing and just about any other activity you can find while traveling Mongolia. One of the most beautiful and easily accessible lakes in Mongolia, Terkhiin Tsagaan Nuur or “White Lake” (not to be confused with Tsagaan Nuur in the north) is set amongst the Khangai mountains and is banked by the mighty Khorgo Volcano on its eastern end. With so many great activities on and around the lake, this is the perfect place to lace up your hiking boots and head to the trails. There is also a good network of tourist gers and the windswept lake offers great fishing. You’ll probably want to hop on an expensive flight to get here, rather than trying to survive 30-40 hours of bumpy bus travel from UB. Often thought to be the most beautiful region in Mongolia, there are a ton of great treks, superb fishing and some breathtaking scenery in this high altitude landscape. Travel here becomes more difficult, but also more rewarding with a backdrop of the 7,000 + meter high Altai Mountains looming behind the northwestern steppe. The vast and seemingly empty steppe of Eastern Mongolia is teeming with some of the country’s most fascinating wildlife. Endless grasslands stretch out to the horizon until they finally meet with the enormous blue sky above. Follow in the footsteps of history’s most notorious conqueror from the village of Dadal where Chinggis Khaan was born, all the way to the foothills of the Khan Khentii mountains. This is where the Mongol Empire began, and despite being one of the most beautiful regions in the country, you’ll find this area almost completely devoid of tourists. In Mongolia, man’s life revolves around his horse. Almost every song played on the radio expresses the Mongol’s pride in his nation and love for his stallion. There’s no better way to experience the vast open steppe than from the back of one of these revered creatures. Plan a day, a week or a month with your horse and guide so that you can see the country as it has been seen for centuries, from horseback. Did you know that horses produce milk? Did you know that if you let the milk ferment for weeks in the heat that it turns into a vial cocktail that will either put hair on your chest, or peel paint from the walls? Arag is the Mongol drink of choice and if you can keep it down, you may find that you’ll have some great experiences drinking with the locals while they laugh at your grimacing face after every sip. Even The Kids Drink Arag In Mongolia! It’s starting to sound like you have to sip spirits or snort stimulants to have fun in Mongolia. In reality, snuff will be offered to you as a form of respect and if you choose not to inhale the powdery poison into your nose, you can simply take a whiff of the bottle and hand it back without actually inhaling any. Whether you decide to take a hit or not, always receive the bottle with your right hand while placing your left hand on your right elbow and avoid rejecting the offer completely. At the very least, smell the bottle and hand it back. Our epic 8 day independent trek through central Mongolia was not only our favourite experience while traveling Mongolia, it was one of the best things we’ve done in travel. Have a look on Google Maps to find a river that seems easy to follow, has a good starting & finishing point, and is popular with local nomads. Pack a bunch of freeze-dried food, cooking and sleeping supplies and head out onto the steppe for a multi-day trek. You don’t have to be a professional navigator, you just need to have your wits about you and be able to follow the river. The encounters you’ll have with the wilderness and the nomadic families will stay with you forever. Did you know that Mongolia is home to the largest freshwater trout in the world? Hucho Taimen or Siberian Taimen can grow to over 200 cm (6’10’) and 100 kg (220 lbs)! Mostly found in the northern rivers of Mongolia, the Taimen can be found in both the Arctic and Pacific drainages, specifically the Yenisei/Selenga, the Lena, and the Amur River Basins. If you’re not trying to land a 100 kg monster, there are plenty of Lenok, Trout and Grayling as well. There is a strange law in Mongolia that says you can only fish with a registered tour operator. Despite this, you can still pick up a fishing license at the Park Center in most regional sums and fish legally and independently throughout the country. There is no need to book an expensive tour to fish in Mongolia. The Bactrian Camels of Mongolia are native to Central Asia. These camels have two humps, while outside of Central Asia, camels only have one hump. These creatures can stand up to -40 degree temperatures in the winter and 40 degree summers. If you have the opportunity to hop on one of these furry, funny looking creatures, make sure to jump at the chance! If the trip from Ulan Bator to Khovsgol National Park wasn’t hard enough, try hopping on a horse for another 3 days to make it to the Dukha Reindeer Herders of the Taiga in northern Mongolia (also referred to as Tsatsaan). These are the last surviving reindeer herders in the country and they are disappearing fast. Be sure to go with a reputable and respectful guide to ensure minimum impact on this sensitive and dying culture. A trip to the Taiga will likely be a highlight of your trip. Planning an excursion into the Gobi is a definite highlight of traveling Mongolia, but you should be aware that you’ll be in the jeep for most of the time and seeing sites only after a long day of driving! The tours are a minimum of 4 nights, but we recommend doing at least 5. Seeing the Gobi Desert gives you a real contrast from the lush countryside and you’ll learn more about Mongolian culture from this southern sandy abyss. It’s best to book your tour from U.B. 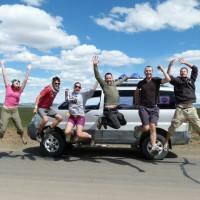 Check out our Guide to a Gobi Desert Tour in Mongolia for tips, info and advice. If you’ve never seen or heard of falconry, there’s no better place to experience this amazing hunting technique than in Mongolia. Ride on horseback alongside an experienced hunter with a massive golden eagle perched on his arm. At the sight of an animal, the hunter will signal the majestic bird to take flight and tackle prey as large as a fox! There are an estimated 250 eagle hunters left in western Mongolia, but you can find eagle tours all across the country. Also known as the three games of men” (wrestling, horse racing and archery), Naadam is held in mid-summer and is Mongolia’s largest festival. Everyone in the country partakes in their local festivities which are usually found in the regional sums or provincial capitals. We saw the Naadam Festival in Tsetserleg and highly recommend it when traveling Mongolia. Given our limited knowledge of horse care and our lack of riding experience, this is not something we were able to do, but we met many other travellers who did buy their own horses. The entire experience – from buying the horse from a nomadic family, to trekking across the country and selling it weeks or months later, would be the ultimate Mongolian experience. There are people who do this with little or no horse riding experience but it would be wise to at least know the basics. Steppe Riders near Ulan Bator is a great place to go for a quick crash course on horse care and they’ll teach you everything from how to buy a horse and grooming it to ger customs and market etiquette. Traveling Mongolia wouldn’t be complete without experiencing The Tumen Ekh cultural show in Ulan Bator, which combines local instruments and dance with throat singing, contortionists and traditional dress. The show is like Mongolia’s Cirque De Soleil and it takes the crowd on a tantalising ride through Mongol history, art and culture. With the predominant religion being Tibetan Buddhism, there are some beautiful temples and monasteries all around the country. Learning about a country’s culture and religion is an important part of travel. Witnessing the morning chanting of the Monks, the spinning prayer wheels and the banging of the gong is an experience you must have here. 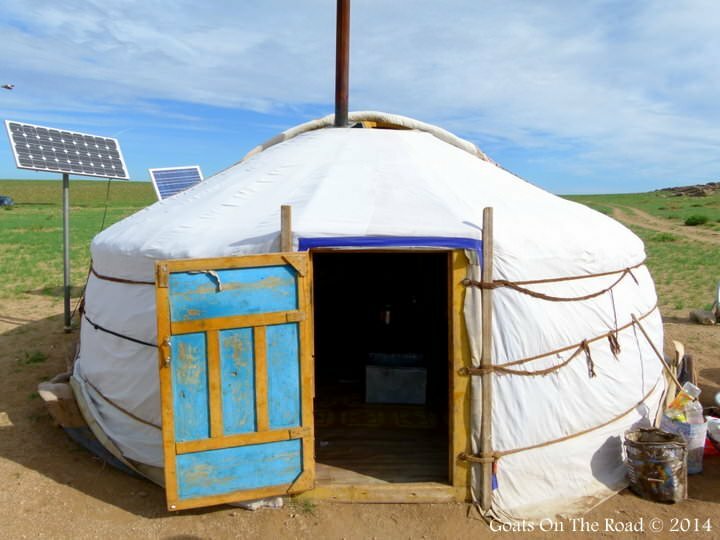 A ger is a traditional Mongolian yurt that is made from wood, felt, canvas and (more recently) plastic. You’ll see them dotted all over the countryside and you’re likely to sleep in many while traveling Mongolia. Just make sure you know your ger etiquette before entering a family’s home. Let’s be honest, not many people visit Mongolia and by coming here, you’re already “off-the-beaten-path”. In fact, 95% of Mongolian roads are nothing more than dirt and padded down grass so it will actually be hard to find “the beaten path”. If you really want to get away from it all, just go to Mongolia and you’ll find a profound connection with nature that will be hard to match anywhere else. Plan your own independent trek and you’ll find yourself as far from the beaten path as you’ve ever been! Mongolia is a place that is as rewarding to travel as it is vast. You’ll likely feel a deep connection with the country the moment you leave the cities and step foot in the countryside. Even though most Mongolians live off of very little, you may find that you envy their level of freedom. Living completely off of the land with the world’s most beautiful scenery forever perched on their ever-moving doorsteps, Mongolian life is the epitome of freedom. 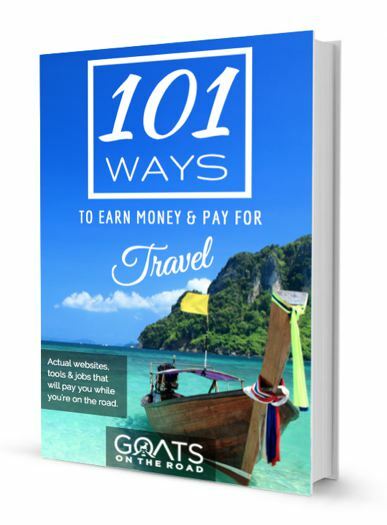 We say this in nearly every Goat Guide because for us, the people are a huge part of travel. 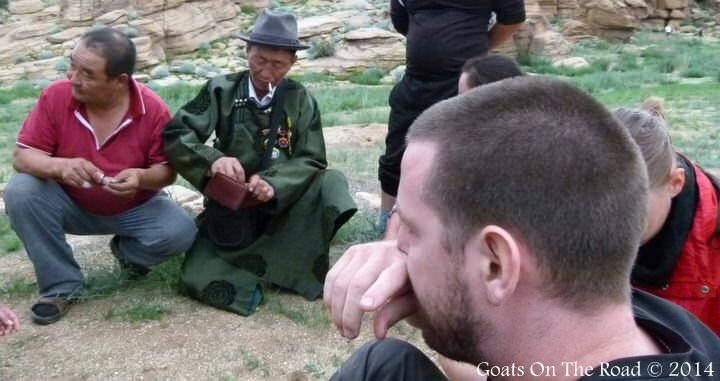 In Mongolia, the people are always interested in you and try to help you out any way they can. If you pitch your tent in the middle of the steppe, you’ll probably have families come by to bring you cheese, kindling, or a silent, but interesting conversation. Be prepared to be invited into gers for hot meals, arag or even a night’s stay. The smiles of these proud, nomadic people are as genuine as their offers to help you in your travels. Mongolia’s nomadic culture is unique and there is nowhere quite like it on Earth. Approximately 30% of people are nomadic to this day! You can’t help but admire the hard-working people for their simple, self-sustaining lifestyle. The predominant religion in Mongolia is Tibetan Buddhism. Visiting a monastery to witness the prayer and practices of the Monks is a must. Have you ever been hundreds of kilometers away from the nearest town? Have you ever been in the far north at night? The stars that you’ll see above the steppe when traveling Mongolia are so brilliant that you may even ponder the significance of our puny little planet. Don’t forget to look up at night! With a country this immense and undiscovered by tourism, there are a few cons to traveling here. It won’t be the easiest place to don your backpack and explore, but it may be the most rewarding. Most travel days in Mongolia will be on jam-packed minivans and jeeps that follow bumpy, nauseating roads. You’ll have to deal with vast distances between sites – 20 hour bus rides are not uncommon and the only alternative is often an expensive flight. If you don’t speak Mongolian or Russian, it can be difficult to communicate with the locals. In the main city of Ulan Bator, you will find many people who speak English. Outside of that, you’ll be forced to use charades, hand motions and drawing pictures! It’s all part of the fun though. We suggest bringing along a Russian Phrasebook. When traveling Mongolia, don’t expect it to be a foodie destination. Mongolian’s typically eat out of necessity rather than pleasure. With limited ingredients in the steppe, your diet will probably consist of unseasoned meat, awful offal and a noticeable lack of vegetables. Dairy and meat are the main food groups eaten here. Strong cheeses and dried meat are also common, though you may find some hearty stews and tasty soups in the sums. In the capital city, you will find a wide variety of international foods, and well prepared local dishes. Goat Note: Despite what some people say, it IS possible to travel in Mongolia as a vegetarian, but it is much easier with a guide to translate. Alternatively you can carry this: цагаан хоолтон (vegetarian in Mongolian) with you at all times! Random Bucket Of Meat Aynyone? We travelled Mongolia for a month and never had an issue with drunk Mongolian men, but they are a common sight in the country. Usually they’re more annoying then they are dangerous, but some travellers have complained about their aggressive behavior. Mongolia breeds a completely different type of intrepid traveller. You’ll meet people who have driven all the way from London for the Mongol Rally, you’ll see couples crossing the country by horse and expeditions driving deep into the Gobi Desert. One thing is for sure, everyone is traveling Mongolia for an adventure. Proud, self-sustaining, strong and free. There are no people as amiable as the Mongolians. You’ll find that they are welcoming, kind and extremely generous. They are always curious of travellers and love to try to connect with you, even if they can’t communicate. They are intriguing and inspiring people and you can learn a lot from their hospitality and earthly wisdom. In Ulan Bator and some sums, you’ll find many people who can speak English. Outside of these places you’ll have a hard time finding anyone to talk to, unless you know some Russian or Mongolian. As always, sign language and hand motions can do wonders and some of the best conversations are silent ones. As we stated in “The Cons”, getting around in Mongolia isn’t always easy. There are some paved roads but they are few and far between so expect to be rocking from side to side inside a crammed minibus or van. In UB, there are a lot of taxis and a pretty good local transport system, but outside of that you’ll have to find your own ride! Hitch-hiking is common for locals, and you can get picked up easily if you need a ride. There are often shared taxis near the markets in town, but you’ll have to be able to pronounce your destination correctly if you have any hopes of reaching it (good luck). There are four border crossings open to foreigners, three on the Russian border, of which the main one is Altanbulag. The fourth crossing is called Zamyn – Uud near the small town of Erlian on the border with China. By Plane: There are many flights into Ulan Bator from Tokyo, Beijing, Seoul, Hong Kong, Berlin, Moscow, Denver and many other destinations. By Train: Ulan Bator is a major stop on one of the world’s great train journeys, the Trans-Siberian Railway. There are also other local trains to get you over the borders to and from Russia and China. While the scenery on this journey is breathtaking, buses cost about 1/3 of the price. By Bus: The busfrom Beijing to Erlian (Mongolian border town in China) costs 180 RMB and takes 12 hours. Once in Erlian you can take the Trans-Mongolian train (k9) or a local train into Mongolia. There are also buses from Erlian to the border, where you will then need to change buses to UB. If you’re leaving Mongolia for Russia by bus, it’s easiest to go from UB to Ulan Ude in Russia where you can hop on another train or bus to Irkutsk. Canada, Cuba, Israel, Malaysia, Thailand, Laos, Turkey and Japan and Germany. 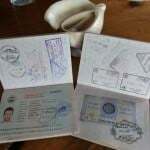 **Please Note: Visa regulations change very frequently. It is best to check appropriate government websites before visiting any country. Click here for more info on Mongolian Visas. The biggest health risk when traveling Mongolia is probably food poisoning and traveller’s diarrhea. Although the food often looks dodgy, we ate everything on offer and never fell ill during our 30 day stay. There are plenty of mosquitos but luckily no dengue fever or malaria have been reported. There are cases of rabid dogs and cats, so beware when entering anyone’s property. If there are barking dogs, try to tell the owner to tie them up and avoid petting stray animals. Even when you think you’re lost in the depths of the vast Mongolian steppe, you’ll see a Mongolian riding on his horse and talking on his mobile phone! There seems to be coverage almost everywhere but in reality it’s only found close to local sums. Wi-fi will only be found in larger sums and the connection is often very poor. In UB, there is good internet, wi-fi and cellular service. Click here to learn more about the data plans available in Mongolia. The best time for traveling Mongolia is during the warmer, drier months between May and October with spring and fall being the absolute best. Mid-August sees the highest number of bugs which can make it difficult to camp in the clouds of flying pests. Ulan Bator is the world’s coldest capital, and across the country winter temperatures regularly drop to -30°C and below. Only the southern Gobi Desert is truly hot in the summer months, though this is also when some rainfall is most likely. Given the severity of the winter months travel beyond Ulan Bator is only really feasible during the warmer months. Keep in mind that while Naadam Festival (July) is amazing to see, it also means that accommodation prices are high and options are low. Goat Note: Weather throughout the world is changing. You can’t even try to predict seasons anymore, but you can assume that Mongolia is freezing after October. Mongolia is one of the remaining offtrack destinations and it’s beckoning intrepid backpackers to come and discover its vast open steppe, sparkling rivers and hostile deserts. If traveling Mongolia was a little easier, and if the food was tastier, there would definitely be more people visiting this country. But, what sort of an adventure would it be if it were easy?! We wouldn’t change anything about Mongolia and hope that it stays the same for decades to come, but newly found minerals and a growing cosmopolitan culture means that the proud nomadic lifestyle is under immense pressure. Get here now before it changes and experience a place unlike any other. What a wonderfully thorough guide! I’m going to show my partner Sam this as soon as I get home tonight 🙂 He has always dreamed of visiting Mongolia and I think once we explore Asia this summer (a dream I have always had) we would definitely considering exploring Mongolia. Great guide. I hope you guys make the effort to get here, you won’t be disappointed! Wow, what a great guide guys! And I love these panoramic pictures, by the way – great way to show off the amazing looking landscapes. The scenery of Mongolia is definitely something worth showing off 🙂 Thanks for the comment. Great guide Goats. I was lucky enough to visit Mongolia for two weeks a few years back and your article is pretty close to what I experienced there, except in my case the local drunks were more on the aggressive than irritating. Maybe that’s changing? That’s too bad that you experienced aggressive drunks. There definitely was a lot of drinking happening when we were there but we never felt threatened or nervous or anything, and we were there during Naadam! Hopefully things are changing and in a few more years there will be even less drunks. I m feeling that i had great expidition in mOngolia . 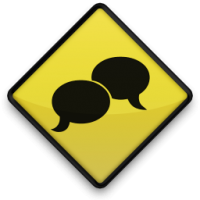 What a great manner u explain and gave details..
What a comprehensive post – thank you so much! This could form part of a book!!! I’d love to go to Mongolia some day; having travelled through all the ‘stand’, I think Mongolia is the logical next step. I agree that going to Mongolia seems like the next logical step for you 🙂 haha. Have you been to Russia? You could do the train! Have to say ‘Thank you guys!’. What a great guide…… Lots of information and details. As I am a guide I find it very usable for myself. Yes, we loved your country 🙂 The food was so-so haha, there were definitely some great dishes to try though! We would love to come back and see more. Thank you Zaya 🙂 We loved our time in Mongolia and can’t wait to return! What a great guide! That´s a lot of information, I´ll definitely need to go through this article again before I go to Asia. I´m actually considering either Mongolia or one of the “stans” (most likely Kyrgyzstan). Could you maybe compare the two countries and which would be your personal choice? Thanks also for the info on food, I was a bit worried about it, because it´s not always easy for a vegetarian to travel to certain countries where cuisine is very specific. Now I´m worried less! 🙂 thanks. It’s very hard to compare the two to be honest. They are similar in that the people are nomadic, or semi-nomadic, but it’s different in religion, food, cities, and topography. For us, it’s really hard to choose a favourite out of the two because we did epic treks in both, enjoyed the people in both, the food was so-so in both (haha), but the nature was fantastic in both! Wow! What a wonderful and informative post! Keep up the good work! Are you guys still traveling? That is a really comprehensive guide and insight, especially on the treks. Mind sharing how much is the average cost you spend for lets say per day or a month in Mongolia backpacking and trekking? PS: kyrgyzstan as well if you still remember :P.
Thanks for the comment. We keep track of all of our budgets, so I can actually tell you exactly what we spent.lol. 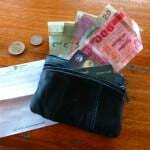 In Mongolia, we averaged $79.41 / day for the both of us and in Kyrgyzstan we spent $63.29 / day for us both. This includes everything. You have such wonderful guides, it’s a treat for all of is who dream of backpacking! Me and my friend are talking about taking the trans siberian railway from Moscow, through Mongolia, with Beijing as the final destination, before we continue furthere south towards Bangkok and Vietnam. We are thinking of starting our travel in january/february, but we are a bit afraid of the winter temperatures we can expect, particularly if we were to spend a couple of nights camping in Mongolia. Do you think this is a pointless route, with the cold temperature in mind? After reading your blog, you two seem like the most reliable source out there! Air temperature is the lowest in Mongolia during January. At night, temperature could drop to -50. So camping is almost impossible during this time of the year. A day of researching , I swear this is the best informative post ever. Thank you so much. I’m going solo. and most questions I had on my mind is answered ! I’m about to book my flight. I would like to find out. Would 15 to 20 days be enough to cover all the areas your highlighted above. I want to make the best of my trip. But i Understand every beauty above is located one end of Mongolia and travelling itself takes up a lot of time. Looking forward to hear your thoughts. Also I’m going solo, would it be easy to hook up with other backpackers at hostels and travel ? Cheers. Excitedly looking forward to your reply. Exciting that your’e planning a trip to Mongolia! We love it there. 20 days would be good, travel days and time in Mongolia can be a bit slow. lol. There are backpackers in UB who you could meet up with for sure. I am Jean from Selangor, Malaysia. I am planning for June in Mongolia for 3 weeks+ on budget , able to camp & hike , stay in backpackers hostel/dorm. , can i ask if we can travel part of the trip & share cost, looking forward to your itinerary & details . I have done backpacking/hiking in Nepal a number of years ago & have been camping/hiking in Malaysia for 10 years . Super helpful post – thanks! I wondered if you had any idea when Mongolia starts to get warm again. I’m thinking of visiting around April – do you think that would still be too cold? Mongolia starts to warm around mid-May. You can see more here: https://www.discovermongolia.mn/the-best-time-to-travel-to-mongolia/ Happy travels! We are considering hitting up Mongolia later this year with our 2 children (aged 6 & 3) our kids aren’t new to traveling and we did 3 weeks with them last year backpacking around Vietnam & Cambodia but I am wondering what your thoughts on bringing them to Mongolia is? Mongolia would probably be exciting for them, especially if they like trains or horses and the great outdoors. The food isn’t very good though, that’s the only thing – in UB you can find good food, and there is one restaurant in Tsetserleg, but apart from that, it’s pretty basic. There is a good grocery store in UB though that you can stock up on. Kids would also find the dino skeletons and fossils in the desert interesting too. But, transport isn’t great….hmm, I’m not sure! Hi! Thank for the great post! I am going to mongolia for 3 days and I am having a hard time choosing what to see in such a short time! What do you think its the best? Do you think I am missing something that is more important? Hello Guys , Firstly Thank you so much for this post, I am so glad to read this. if you need translator in UB for those needs. 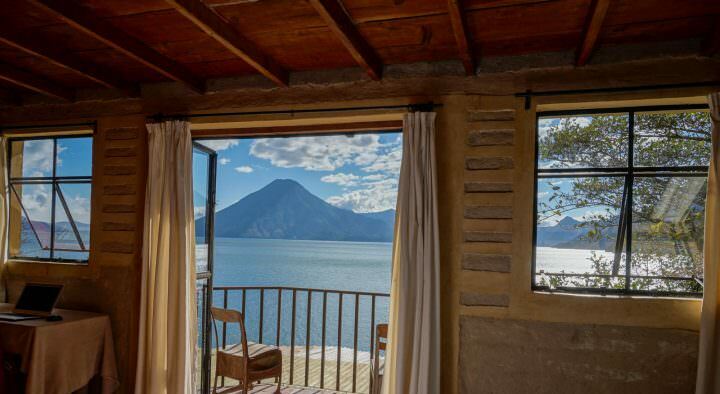 /for connect to someone, to find hotel, to find traveling tour, and watching something and so what you need all things/. Hello Guys , Firstly Thank you so much for this post, Im so glad to read this. Wow! Thanks a lot ! I am happy that i have discovered your Blog. It is beautiful guys! I am collecting recipes from all over the world and i hear you when you say its not a foodie destination. But i cannot wait to see the authentic cooking in the wild and meeting the local people of the steppe and watch the stars with my girlfriend 🙂 We are going this summer via the Transmongolian Railway. I have been to Kyrgystan and Kazakhstan in 2014 and absolutely loved the lifestyle of the nomads. Fantastic! Oh yes, meeting the locals and eating what they do is all part of the fun for sure. We learned how to make traditional dumplings (I forget the actual name of them), but that was a lot of fun. You’ll find some receipes for sure! Hi! 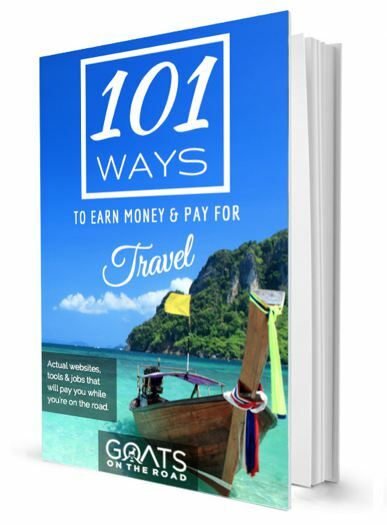 Awesome travel blog and tips! I’m heading to Mongolia in a couple of months, and am a little worried about the stray dogs. Would like to check, did you guys get any vaccine shots before your trip? Thanks!! We didn’t have any issues with stray dogs whatsoever. We had a rabies vaccination in 2008, but haven’t had a booster since. I’m not sure how long it’s valid for! Hi. I am mongolian and you don’t have to worry about stray dogs. In UB you may encounter many stray dogs but it won’t attack you. In Countryside, if you enter other people’s property without permission dogs might attack you. I am so glad to hear about your experience in Mongolia! You made a very good description of this country, its generous people and incredible landscapes. I have been there myself last year and definitely want to return. I keep wonderful memories of learning local card games with kids, drawing pictures to communicate, drinking suutei-tsei (tea with milk and salt) with every family and being dropped of a motorbike with the words “here is the flock of sheep, there are the gers, bring them back by nightfall!” haha. And so much more! 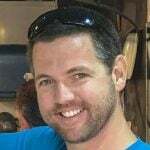 I just wanted to say thank you for inspiring other travellers to get started in this big adventure. Your website is also fantastic as it has so many true and detailed information. Keep it up ;)! An inspiring and helpful article – thank you! I am a 21-year-old female and am planning on backpacking Mongolia alone. Am I crazy? Not crazy! Just need to be mindful of our surroundings as you would anywhere in the world. Don’t go on tours that are only you and the (male) guide, don’t find yourself alone at night, don’t be out in the middle of nowhere by yourself, etc. Have a great time! Thanks so much for all your tips and advice! This is such a great guide! We are just finializing our trip to Mongolia now for August and I can’t wait! Looking forward to experiencing all the amazing things you have written about! I’m really liking your blog! I’m currently torn if I should spend the money to go to Altai. I really want to go to khovsgol and see the reindeer people, do a homestay/farmstay somewhere in the same area, and visit the monasteries in the central region. Of course, Gobi. Altai looks great.. BUT: we only have 3,5 weeks. And we will be visiting Kyrgyzstan and Tajikistan after. I think we might see similar things there. Based on your experience, can you make me any suggestions? I don’t want to see too much of the same stuff, if you catch my drift. I can’t believe that buying a horse and riding it across the country is a thing. I had the country on my bucket list but I’m definitely adding this part. Also pinning for my trip because this post was SO insanely helpful! Thanks for sharing! 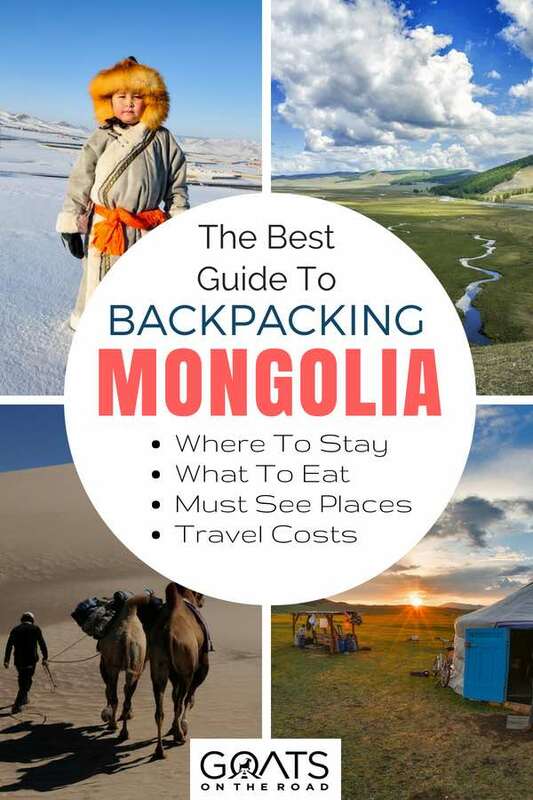 What a handy guide to Mongolia. I hope to go there next year, so this post is bookmarked. Thanks! Thanks for the great information. I bought my plane ticket to Moscow to strat my Trans Siberian + Trans Mongolian trip to China for 40 days. I will spend about 7 days in Mongolia. I know it just a short time for such a big country. Wow! What a fantastically detailed guide, thank you so much for sharing. My partner and I are travelling here Mid June til Mid July and using your blog for lots of inspiration. Will we be ok not joining a tour or hiring a driver? Our friends said we’d need to but we’d love to avoid if possible. 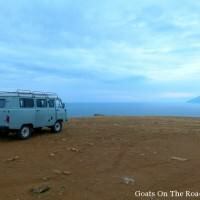 No, you don’t need to join a tour or hire a driver in Mongolia. There are buses that you can take, and shared cars. However, if you want to get out to the Gobi, you’ll need to join a tour, which I suggest you do in-country. I am planning on passing through whilst travelling the transmongolian and will have about 4 days to explore the surrounding area around UB. I’m intersted in Terelj and Hustai National Parks, but the organised tours are way too expensive. How easy is it to grab a taxi to get around? Do I need to book my stay in a Ger in advance or can I turn up at the park and find Ger camps there? Thanks for any info, it’s hard to come by! That’s great that you’re planning a trip to Mongolia / the trans mongolian! We loved our time in the region We took a bus out to Terelj and then just used shared cars / hitchihiked around the park…and we hiked a lot. You can see our article here: https://www.goatsontheroad.com/a-quick-trip-from-ub-terelj-national-park/. You don’t need a tour. We booked our ger in advance because it was through our guesthouse in UB. If it’s the high season when you’re going, I would maybe book in advance. Greetings – We are looking for recommendations for tour companies or guides to help us tour Northern Mongolia from August 11-19. We are experienced travelers and would be open to staying in gers or tents if this is necessary. We don’t have any food aversions but have heard that the Mongolian diet may take some adjusting to for Westerners. 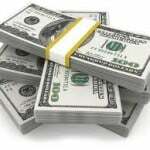 We have budgeted to spend around $80 per day for hotels, transportation, food, and entrance fees to attractions. After we attend the opening reception of Land Art Mongolia, we will be able to leave Ulanbator on 8/11 and we have approx 9 days to explore Mongolia. Below is a very preliminary general description of places we are considering visiting in Mongolia. We are open to any of your suggestions of other possibilities. Khovsgol Nuur NP – the lake region that Mark described as similar to Baikal. This is a great post and well laid out! Thanks for sharing! Hi Goats on the road. 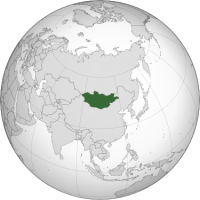 I’m in the midst of doing some future planning for me and a bunch of mates who have all agreed that Mongolia is the next place we would love to visit. We are usually independent travellers or used to overlanding budget travel but realise that Mongolia isn’t too user friendly to this tourist market. We wouldn’t be offended ( and expect to a degree ) that we would need to couple an organised portion of the trip with some self travel. Can this be done and do you have any suggestions on where we could this ? Do you have any advise on where we would be better off to arrange organised portions of travel and where it would be easy for us to go it alone ? My research is in the early stages at the moment and places / destinations are not confirmed. I would say we would have a maximum of three weeks to travel. Any recommendations on itinerary must do’s would be helpful. I appreciate your time and love your post – very helpful. Thanks – and hope to hear from you soon.